Hi, I’m Marilyn Foreman with Quilt Moments patterns. I am happy to talk to you today about my 3 new patterns featuring the popular Lil’ Twister and Twister tools: Twister Illusions (QM131), Twister Tapestry (QM130) and Triple Twister (QM127). 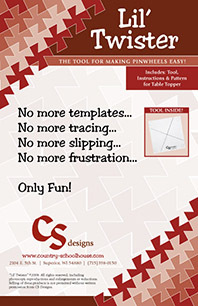 The Lil’ Twister and Twister tools were created by Marsha Bergren of CS Designs (Country Schoolhouse) and they continue to be on the top selling notions lists. 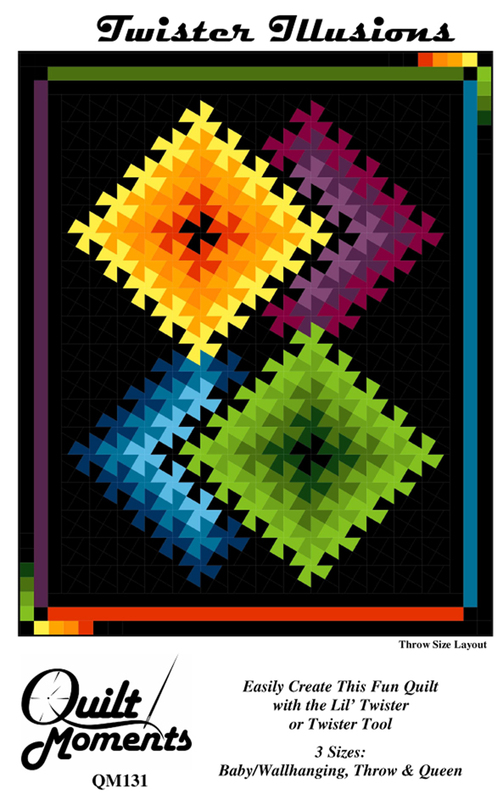 The Lil’ Twister is used with 5″ squares and the Twister uses 10″ squares. My 3 pinwheel patterns utilize the Lil’ Twister for the smaller quilt sizes (baby and throw) and the larger Twister tool for the queen size quilts. Works great with solids like Moda Bella solids. Moda’s marbles and batiks work well, too. You can play with shades of your favorite colors and a background. I used shades of yellow, green, purples and blues on a black background. The Bella solids color card shown in Sherri’s November 28, 2012 entry is a very helpful tool to use to select your colors. You can also simply dig into your stash and start playing with the colors that you already have. Have fun creating your own palette. Use a collection of fat quarters or yardage to create a treasured tapestry! 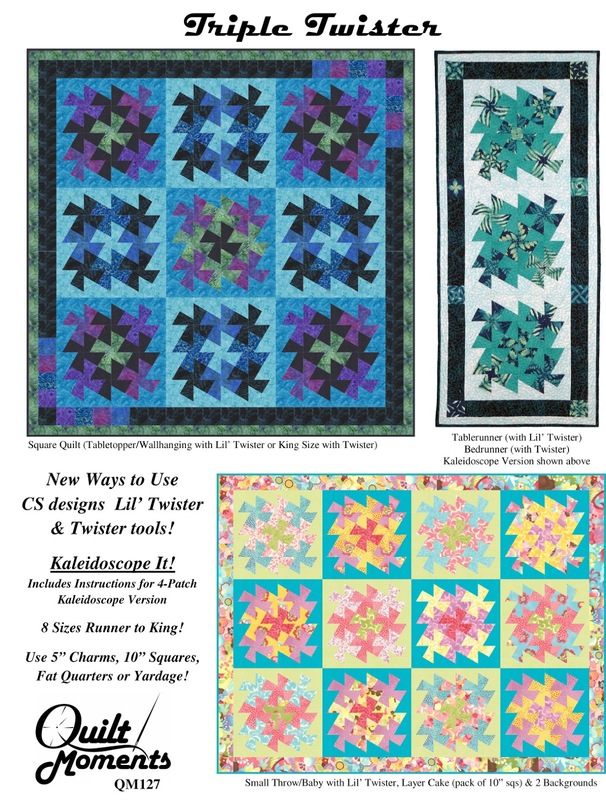 The scrappy quilt shown on the bottom right of the pattern cover was made with one layer cake of Coquette by Chez Moi plus two Bella solids for backgrounds: Turquoise (9900-191) and Light Lime (9900-100). Let’s play with some other fabric lines to see what we can make with this pattern, one layer cake, plus 1 or 2 background fabrics. Here are images using Fig Tree’s Tapestry combined with Marble backgrounds: Sweet Off White (9880-36) and Mulled Spice (9881-79). Which do you like best….one or two backgrounds? Please keep reading…you’ll have a chance to win one of these kits! Next, let’s play with the Snap Pop collection by Sandy Gervais coming to stores in March. Here are images using one layer cake plus Bella solids for the backgrounds: Robins Egg (9900-85) and Bleached White (9900-97). Here are some questions and answers to learn a bit about me. I like to create just about anywhere. I like to create while playing with my fabric stash, dreaming up designs in my sleep and while waiting for the kids at their various activities (I try not to create while driving in the best interest of my passengers and fellow drivers:)). I do have a dedicated sewing room but it’s gotten so overloaded with paperwork and UFOs in the last year that unfortunately I can’t concentrate for very long and find myself trying to escape this room. Sad, I know. My New Year’s resolution is to return this space into the calm, inviting room it once was! I get very inspired by all the beautiful fabrics on the market. I do create some designs in EQ or doodling with graph paper without a fabric line in mind, but often I see a fabric line that inspires the process and I enjoy the challenge of trying to create a design that really highlights the fabrics. What do you like to eat or drink while working? I love all food and sweets so I’m not one to ever go hungry but I do find that I can “almost” forget to eat while I’m working. I can get so engrossed with the design I’m working on that I don’t want to stop to grab food. I can’t tell you the number of times that I have heated up a mug of water planning to make tea and finding it ice cold in the microwave hours later. What do you like to listen to when designing? What gets you in the “mood” to design? While designing I prefer it quiet so I can focus on the process and calculations. However, when I have everything figured out and I’m sewing, I like to listen to books on tape or news in the background. I also recently splurged on a Netflix membership and watched the Downton Abbey series. When I’m not in the mood to sew, it definitely helps if I tell myself I can watch another episode of a favorite show or listen to another chapter of a mystery book. I hope you’ve enjoyed this introduction to my Twister patterns. Please visit my website Quilt Moments to see all my patterns and book. 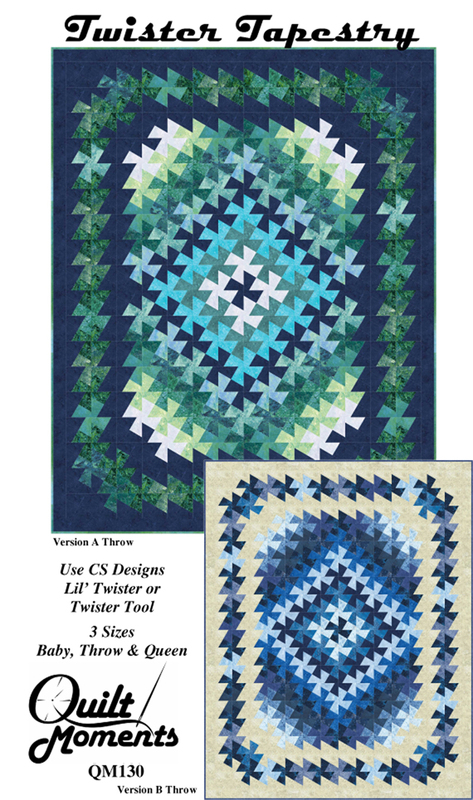 For a chance to win a Triple Twister quilt kit with Tapestry or a collection of the 3 patterns, please leave a comment on my blog. Enjoy ALL of your Quilt Moments! Oh gosh…first never wins…lol I would love to try this out. LI’ve your patterns! Look forward to using the new patterns and fabrics. Love the Lil Twister rulers and your patterns are great! Thanks for the sweet giveaway! What a wonderful display of the wide range of goodness that the twister is capable of. I think this is fabulous! I was hoping to find something with a little more interest than the original design. I’ll be on the look-out for them.